Here I present some pictures and first results of VNA project I have been working on for a while. Main goal is to design two port microwave VNA, which can be used standalone. Designed frequency range of this prototype is ~0.5 to 3000 MHz, but work on 6 GHz version is ongoing right now. Fig. 1. Block diagram of VNA. Built prototype of this version is shown in Fig. 2. Here You also can see early stage of graphical user interface. 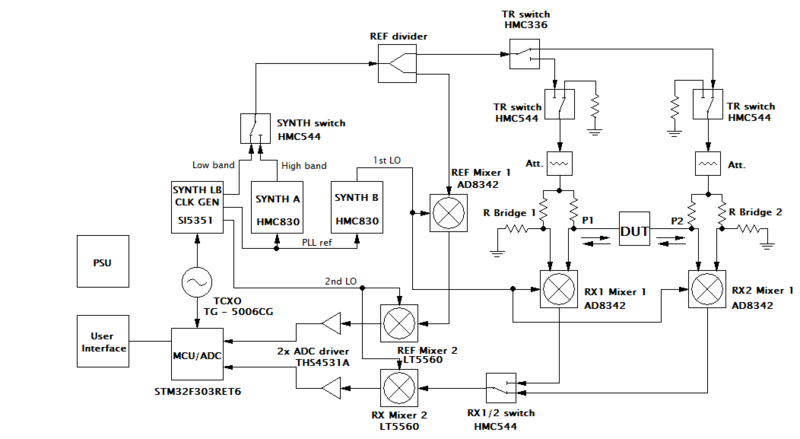 I will not try to go into details of schematic (see attachment's) and PCB design here. PCB is 4-layer ordinary FR4. Fig. 2. Built prototype of VNA. For testing, I mostly am capturing raw scattering parameters via serial port and analysing them with MATLAB. Classic 3-term OSL (Open, Short, Load) and 12-term SOLT two port calibration is already tested. It is well known that calibration error coefficients directly contain info about calibrated VNA raw performance. Fig. 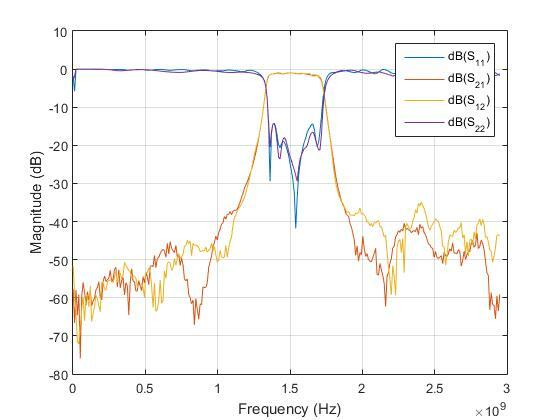 3. shows OSL error coefficients which are simply VNA raw directivity, port match and frequency response. Response is almost the same for both ports. I used simple home made OSL standards which I assumed to be ideal, which is quite true up to ~2 GHz. At higher frequencies this is also good enough for simple comparison at this development stage. Even though, all these errors can be theoretically calibrated out, raw performance is still very important - smaller the error which needs to be compensated, better the calibration stability versus temperature drift and other factors, which is a big deal and actually the main figure of merit / value factor of any VNA, in my opinion. Fig. 3. 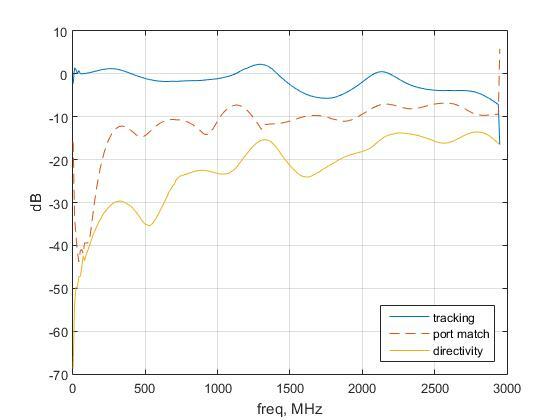 VNA raw directivity, port match and frequency response (tracking) of Port 1. For 2-port VNA, one of most important performance parameter is isolation between ports, which is main dynamic range limiting factor. Although, It can be calibrated out as well, but in practice this error term is usually very small and as a result noisy, so calibrated results can be degraded with noise. Also isolation calibration calls for more complicated and time consuming calibration procedure. Fig. 4. shows raw isolation which is almost symmetric between P1-P2 and P2-P1. 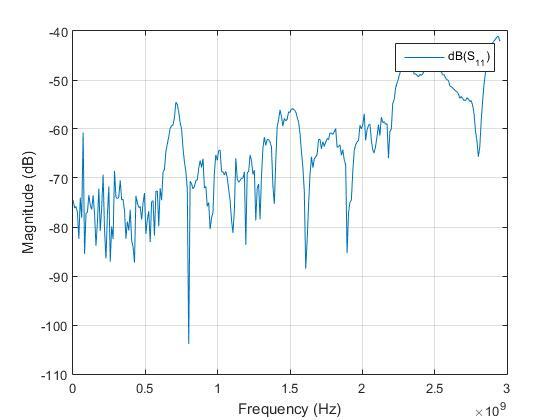 Better than 50 dB range is achieved up to ~2 GHz, which is good result considering dense PCB layout. At low frequencies 12 bit ADC dynamic range is bottlenecking. There are some resonance peaks at about 750, 1500, 2200 MHz, which I suspect are there due to certain parts of current PCB layout and I am hoping to correct these at next prototype. Fig. 4. VNA raw isolation. S21 with both ports terminated. Next, I will show measurement results of various devices. Here I was using already mentioned home made calibration standards which I assumed to be ideal OSL. Fig. 5. Return loss of load standard used at OSL calibration. 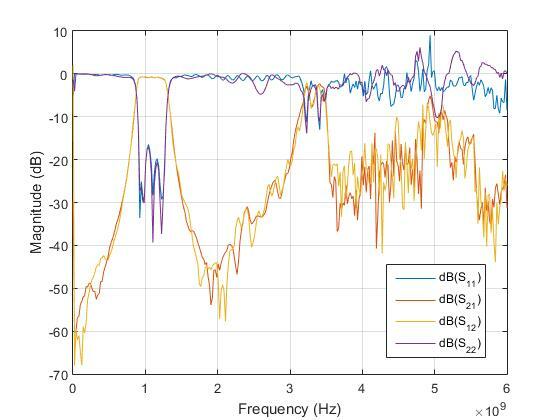 Better than 50 dB range is achieved at all frequencies. Fig. 6. Impedance of 100 pF capacitor from 1 to 500 MHz. Series resonance point can clearly be seen. Fig. 7. Return loss of single untuned 70 cm eggbeater antenna loop. Next two-port measurements are calibrated using 12 error term calibration procedure. Fig. 8. 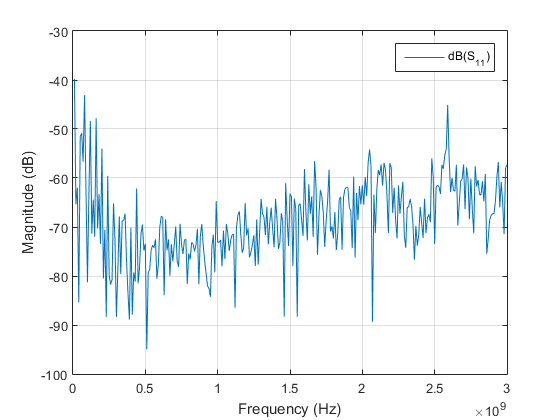 Amplitudes of S-parameters for 10 dB MiniCircuits attenator from 2 to 650 MHz. Fig. 9. 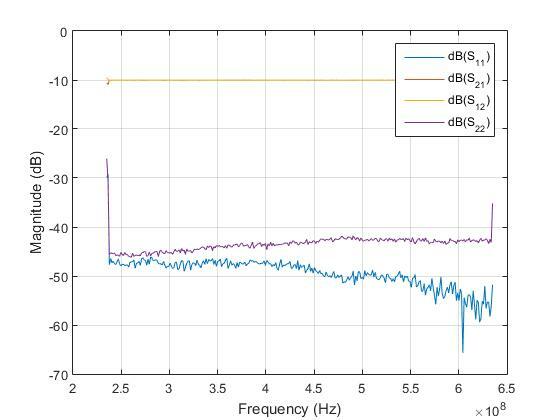 Amplitudes of S-parameters for L band interdigital microstrip bandpass filter. This is the test of operating VNA with third harmonic of RF and LO signals to extend range to 6 GHz. I was little surprised that it actually is not completely unusable. 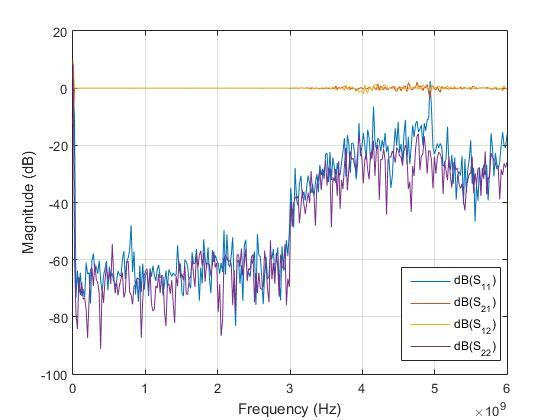 Not only small signal amplitudes is limiting factor in this case, but also completely unspecified mixers and RF switches at these frequencies - it shows what can be atchieved with narrow-band detection. I am not planning to use this technique at next prototype, of course. Fig. 10. Two port though measurement with 3rd harmonic operation above 3 GHz. Fig. 11. 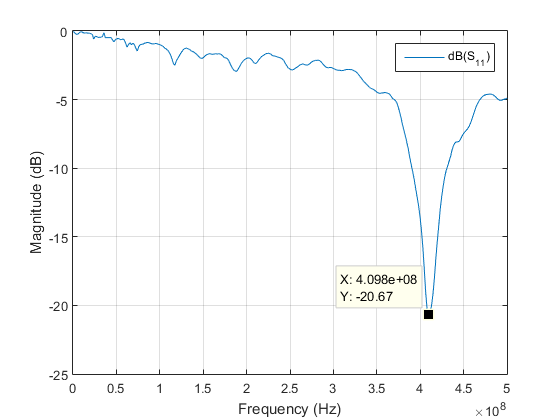 Interdigital bandpass filter (f0~1200 MHz) measurement with 3rd harmonic operation above 3 GHz. Characteristic 3*f0 parasitic response of BPF can actually be measured. Also, I guess there is something that looks like expected 5*f0 response.